Vincetoxicum nigrum. commons.wikimedia.org (Accessed 7/2014). Cynanchum louiseae is a perennial, herbaceous, twining vine 1-2 m long, from a large root crown and colonial from rhizomes, usually unbranched. Leaves opposite, stalk short; blade 5-10 cm long, oblong to egg-shaped, tip long-pointed, base rounded to slightly lobed. 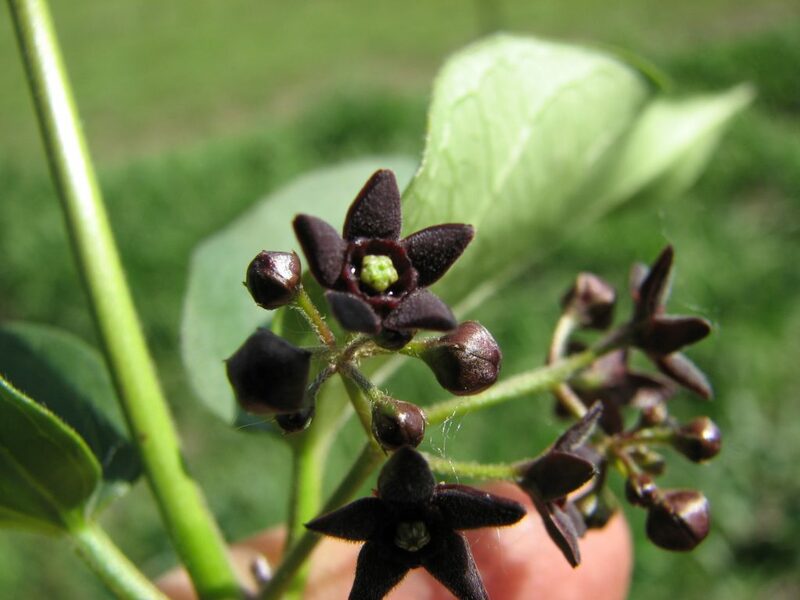 Flowers blackish-purple, radially symmetrical, petal lobes 5, triangular, fleshy, 0.2-0.3 cm long; inflorescence, umbrella-shaped, rather few-flowered; blooming June-Sept.
Cynanchum louiseae. fruit. Leslie J. Mehrhoff. University-of-Connecticut-Bugwood.org.sleloinvasives.org (Accessed 12/2014). 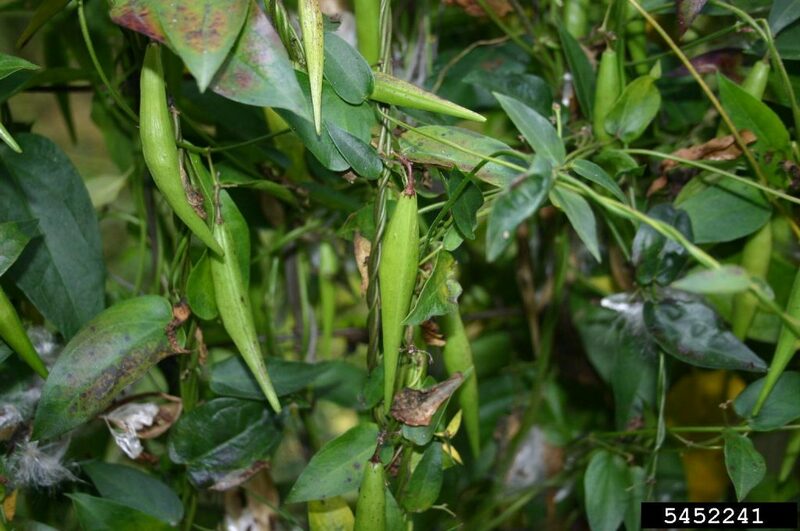 Fruit dry, hollow pods in pairs, 4-7 cm long, narrowly elliptic; seeds brown, flat to 0.7 cm with winged margin and silky plume (Uva et al. 1997). Habitat: Moist, open or partly shaded habitats. Notes: Very aggressive, smothering native vegetation, can kill small trees. 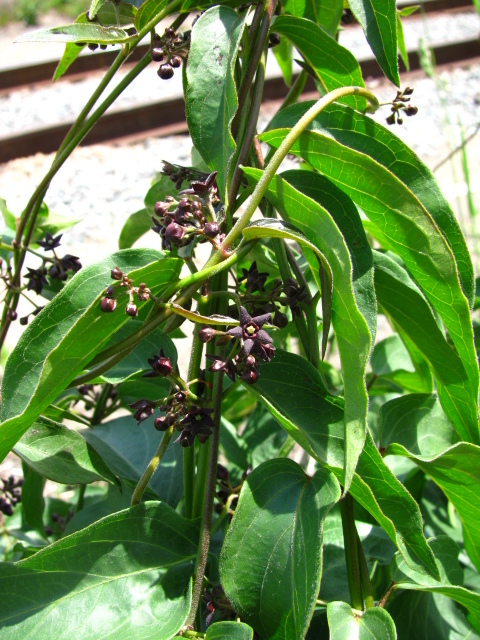 Listed as one of the NYS ”top twenty” invasive plants by the DEC Natural Heritage Program.